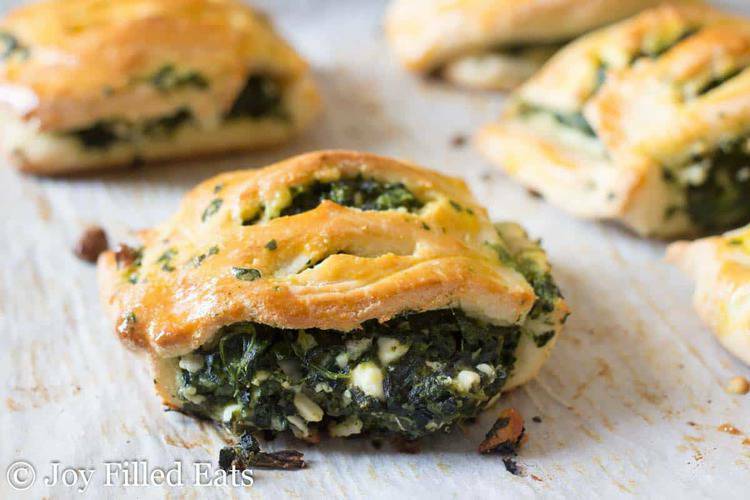 These handheld savory Spinach & Feta Pastries are my favorite vegetarian lunch, snack, or dinner. You don’t even miss the meat when you bite into one. They are filling and delicious. You can eat them on their own or pair with soup or salad. Last July my husband and I were blessed to be able to spend a few days alone in Quebec City where we went on our honeymoon. It was amazing to go back almost 13 years later. We walked the city, relaxed, and ate plenty of delicious food. While we were there we found a bakery that made the best croissants we had ever had. Even the plain croissants were exceptional but I’m partial to the ones filled with unique fillings. We tried a few sweet ones and a few savory ones. 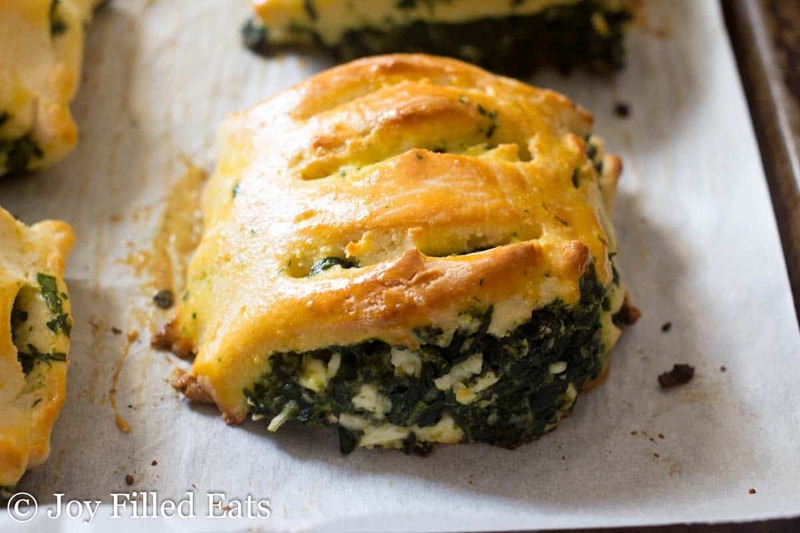 The savory croissant that captured my heart was the one filled with spinach and feta cheese. Ever since the last bite, I knew I wanted to convert it and share it on my blog. 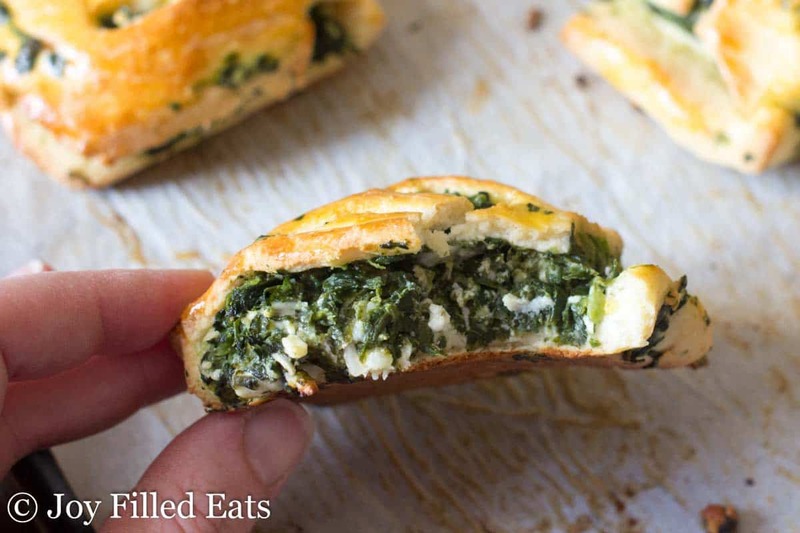 The filling for this is similar to the Greek pastry, spanakopita. 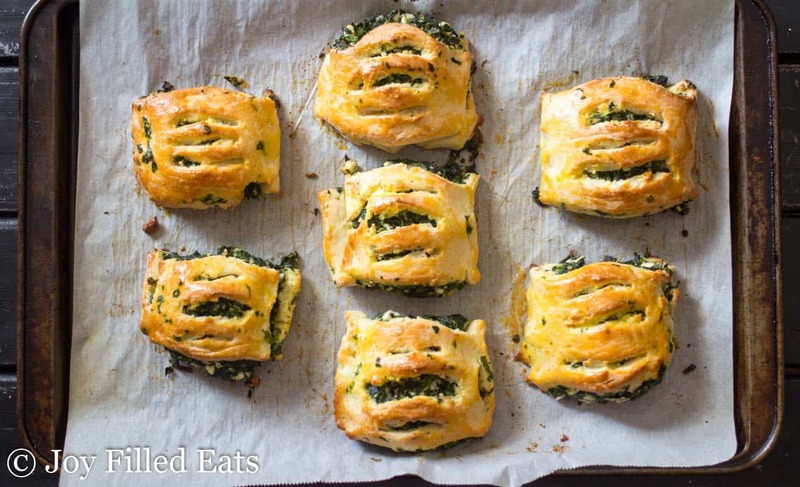 That is traditionally a triangle of flaky phyllo dough with a spinach filling. 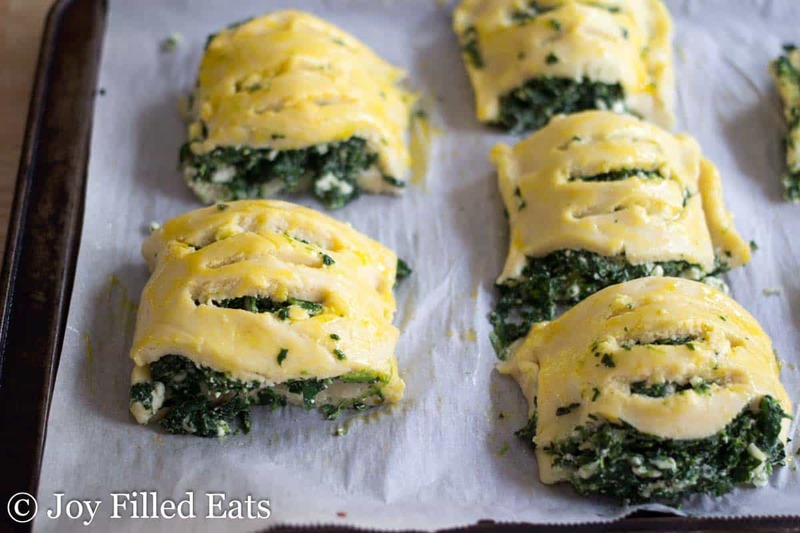 Unfortunately, I haven’t yet found a low carb sub for phyllo dough in order to make a traditional spanakopita. That might be impossible. 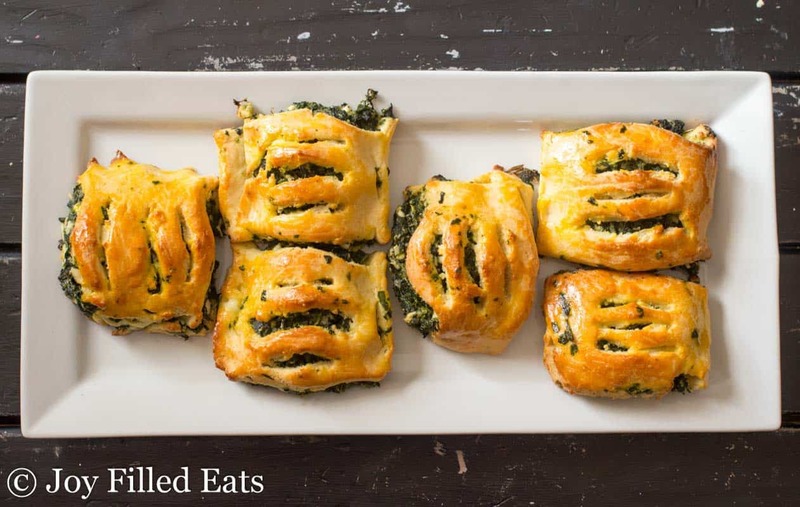 But in this recipe, the mozzarella dough gives the pastry more of a croissant feel like the ones I had on my vacation. 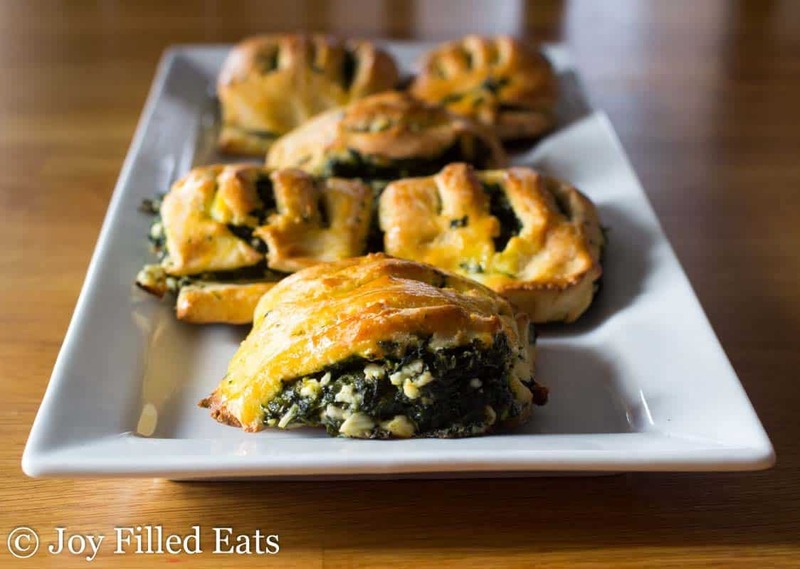 I like these just as much as traditional spanakopita but they are much healthier. 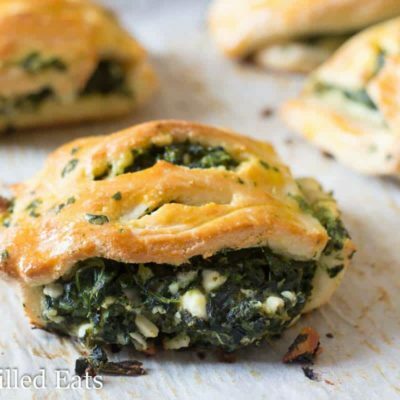 These handheld savory Spinach & Feta Pastries are my favorite vegetarian lunch, snack, or dinner. You don't even miss the meat when you bite into one. They are filling and delicious. You can eat them on their own or pair with soup or salad. Put the mozzarella and cream cheese in a microwave-safe bowl. Microwave one minute. Stir. Microwave 30 seconds. Stir. At this point, all the cheese should be melted. Microwave 30 more seconds until uniform and gloopy (it should look like cheese fondue at this point). Add the rest of the dough ingredients and the cheese to a food processor. Mix using the dough blade until a uniform color. 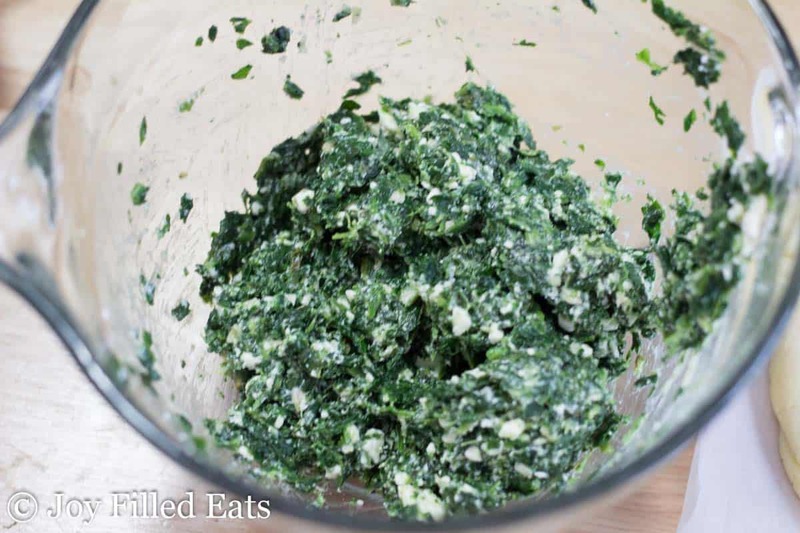 If you do not have a food processor you can mix in a medium bowl with a wooden spoon but you may need to dump it onto wax paper and knead it by hand to thoroughly incorporate the ingredients. Stir together the ingredients for the filling. Set aside the egg yolk to brush on the pastries. 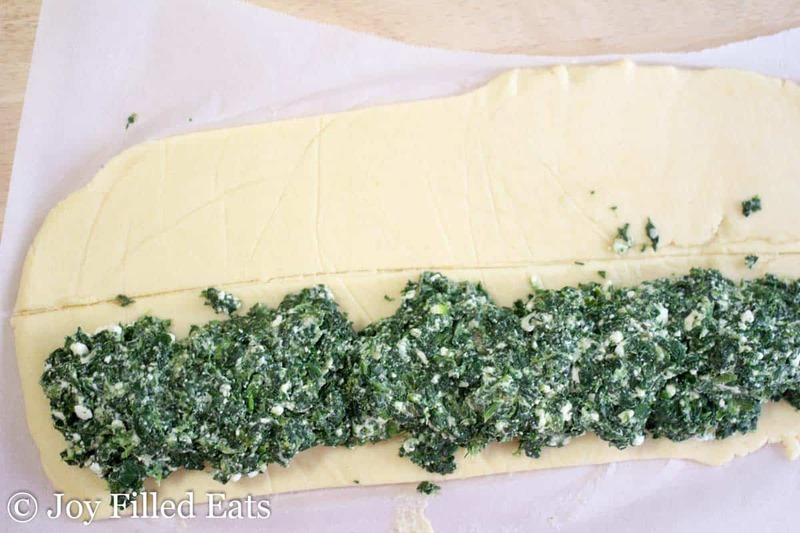 Roll the dough out between two pieces of parchment paper into a 6 x 18 inch rectangle. Cut in half lengthwise with a pizza cutter. Put the filling down the center of one piece. Top with the other piece of dough. Use the pizza cutter to cut into 7 or 8 pieces. 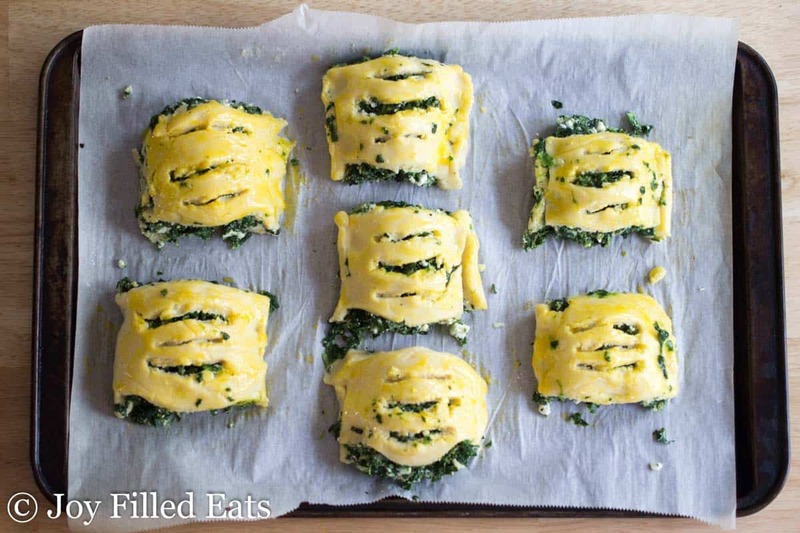 Put them on a baking sheet lined with parchment. Gently press the edges together on two opposing sides of each pastry. Use a kitchen shears or small knife to make a few slits in the top dough. Brush with the egg yolk. Bake for 30 minutes until golden brown. Recipe looks great. But my one big problem is my daughter is trying to go keto with me but is allergic to all nuts, can this be made with just coconut flour? There are fathead dough recipes that just use coconut flour. You can sub in one of those. I am making these for a bridal shower next week! Thanks so much for sharing!!! If you didn't thoroughly incorporate the melted cheese and flours that could be the reason. If you have a hand mixer that might work better than mixing by hand. I really do prefer a food processor for mozzarella dough. Has anybody tried the mozzarella dough with real mozzarella or does it only work with the rubbery grated mozzarella I have seen in North American supermarkets? I'm in Europe and we don't have that type of grated mozzarella here. It doesn't have to be pre grated but fresh mozzarella will not work. Would this be a good crust to use for sweet hand pies? Yes, as long as the filling isn't too wet. If it is then the bottom can get soggy. Yum! Thank you. Can these be frozen? This type of dough freezes ok but not great. I have frozen them but prefer them fresh. looks delicious, can I skip the coconut flower and substitute it with almond flour? and is almond flour just ground almond? I use finely ground blanched almond flour. Ground almonds is almond meal. You can use all almond flour but you may need up to 2 cups. The coconut flour absorbs more moisture than almond flour does. My dough is quite crumbly. It's all good except for that. So instead of nice slits at the top it's all cracked. Hmm.. I use this dough quite often and it's not crumbly for me. I wonder if the brand of coconut flour you used might be drier. I use Bob's Red Mill brand. 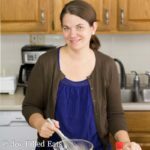 Taryn, I have bought two food processors, and so far none are powerful enough to make all the low carb recipes. I end up having to mix a lot by hand. My question to you is which food processor really has the gung-ho to make anything process well? Is capacity an issue? Thank you so much! I have a cuisinart food processor and have never had trouble. I think it's an eight cup. I've had it for about ten years. I think brand matters with appliances like this.